How would you describe your experience of working with cork? 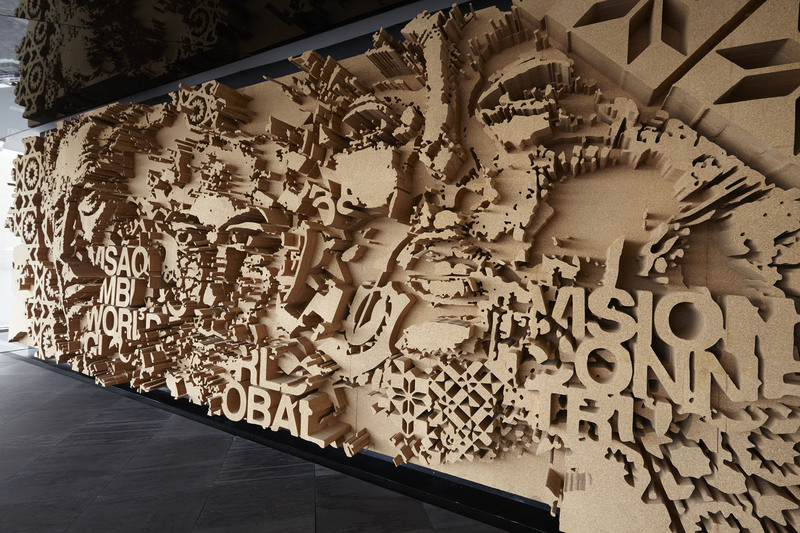 Vhils – It was very interesting. Cork turned out to be a material with many strengths, including being sustainable, lightweight and resistant. Without a doubt. I’m actually working on this. What characteristics would you say cork has as a material to be used for works of art? Versatile, malleable, resistant, lightweight, sustainable, and it has an interesting and variable look and colours. Can you give a brief description/presentation of the work? At the conceptual level and material used (dimensions, etc.)? The work is 447cm x 450cm x 40cm. The base layer (first layer) is steel lined with a cork sheet. The remaining 3 layers are agglomerated cork. The work is a large format sculpture, based on the “Diorama” series that I started last year using another material, polystyrene foam. 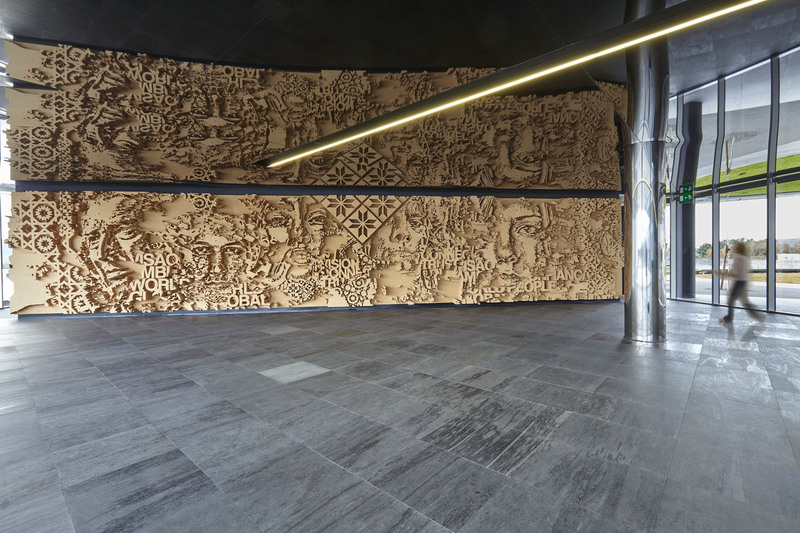 It has intricately cut out geometric shapes to represent the urban and industrial space, with a human figure standing out. The idea was to reflect on the influence the cork industry has had on the local population, in both economic and social terms, exploring this interdependence between industry, workers and growth of the region. In other words, it expresses the relationship of proximity between individuals and the urban and industrial space where they live and work, emphasising this cycle of dependency, and reciprocal development and training. It also pays homage to the workers who today make this one of the most important industries for the country, applause that I think is even more necessary at this time of economic crisis where the enormous lack of investment in national production in recent decades is discussed. But I also leave some space for the work to be assimilated and interpreted by each person in their own way, because it is this personal side that complete it and gives it the final meaning. What is to be the work’s fate? If it is not bought by Santa Maria da Feira Council, it will be transported to my archive and remain in my personal collection. Can we consider you, after this experience, an “ambassador” of cork? In other words, will you advise other artists to use this material? Ambassador is rather a strong label. Although I would, without a doubt, recommend it and even try to create a residency programme for artists in the factories so they can explore cork. It interests me a lot. Let’s see if it’s possible. How would you describe cork in one word? 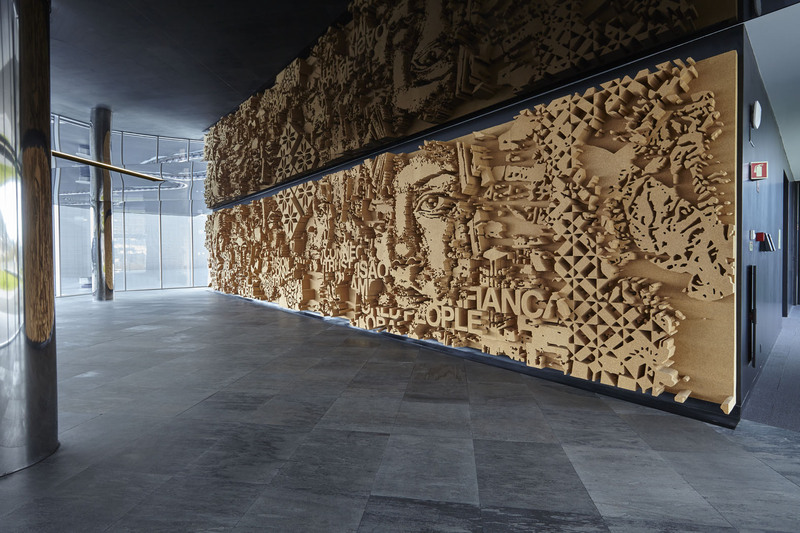 Alexandre Farto has performed his work in the urban environment under the name of Vhils, ever since he started out with graffiti at the beginning of the 2000s. 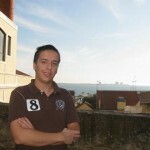 He was born in Lisbon in 1987 and grew up in Seixal, a region with a major industrial tradition. His work has been heavily influenced by the in-depth development that transformed Portugal in the 1980s and 1990s. He divides his time between Portugal and London, where he works at the Lazarides Gallery. He is an avid experimentalist. He has developed his “aesthetics of vandalism” in individual and collective exhibitions and interventions all over the world, on a wide range of media – from stencil painting to wall sculptures – which has made him one of the most acclaimed names of urban art worldwide. 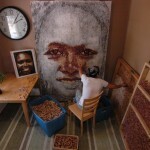 His street works are easily identifiable because he carves enormous faces and the skylines of cities on the plaster cladding of building walls he uses as a canvas. 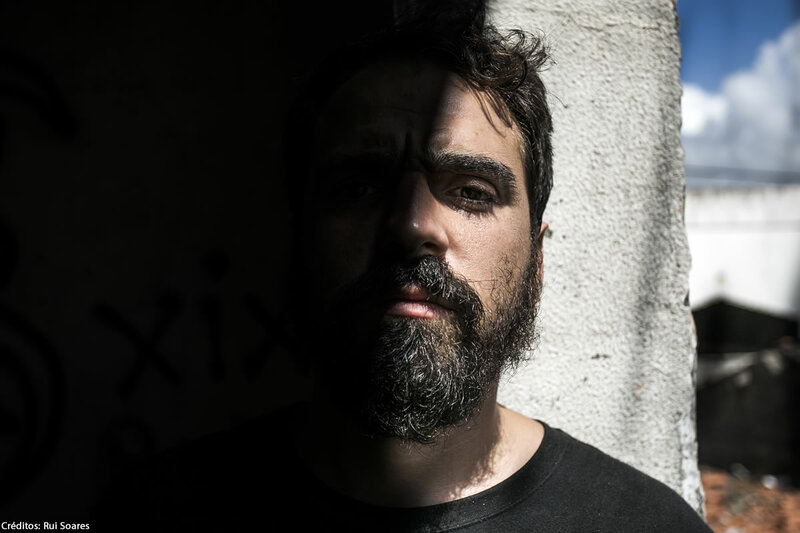 His works are displayed in Portugal, England, Italy, Russia, Colombia and the USA and he has participated in the most renowned international festivals, such as The Cans Festival (London), FAME Festival (Grottaglie, Italy) or NuArt (Stavanger, Norway). He uses a variety of materials in his gallery works: paper, wood, metal, collages, installations and video. He is considered one of the best street artists of the current international scene.